Portland Police Officer Michelle Cole, of Casco, has worked with her canine partner Kaine for more than seven years. Cole is working with Rep. Jess Fay, D-Raymond, on a bill relating to first aid and emergency care for police dogs like Kaine. CASCO — Michelle Cole’s partner in the Police Department may be retiring in the next few weeks, but she’ll still be able to give him commands. Cole, a Casco resident originally from Buxton, has worked and lived with her 8-year-old German shepherd partner Kaine since he joined the department as a young pup. She is now working with Rep. Jess Fay, D-Raymond, on legislation would allow emergency medical care for police dogs like Kaine. The bill that Fay has introduced, LD 1716, seeks to shield emergency medical personnel or law enforcement dog handlers from civil liability in cases where they provide critical first aid or emergency treatment to a police dog, search-and-rescue dog, or service dog before the animal is brought to a veterinarian. Good Samaritan protection for non-veterinarians providing emergency care to animals already exists under the Maine Veterinary Practice Act, but proponents of Fay’s bill say the additional clarification is necessary to shield first-responders and dog handlers from civil action if something goes wrong. In her testimony, Cole credits Annie Wright of the Maine Veterinary Medical Center in Scarborough for connecting the law enforcement and veterinary communities in the discussion. Cole brought the idea for the bill, which was “years in the making,” to Fay earlier this year. Agreeing to sponsor it was an easy decision for Fay, who represents parts of Casco, Poland and Raymond. “They had all their ducks in a row – I was the shepherd,” Fay joked. Other cosponsors from the area include Rep. Kevin Battle, I-South Portland; Rep. Patrick Corey, R-Windham; Sen. Bill Diamond, D-Windham, and Rep. Ellie Espling, R-New Gloucester. Along with supporting testimony from several veterinary professionals at the Maine Veterinary Medical Center, the bill has support from the Humane Society of the United States, Maine Search and Rescue Dogs, and Portland Police Chief Michael Sauschuck. “Our canines are specially trained to assist law enforcement personnel in tasks such as locating missing people, finding evidence at crime scenes, searching for drugs and explosives and, most importantly, protecting their handlers,” Sauschuck said in testimony, emphasizing that the animals deserve quality first aid and treatment in return. Cole said the Portland Police Department owns its six canine officers, but Kaine lives with her and the department pays for costs such as food and veterinary services. 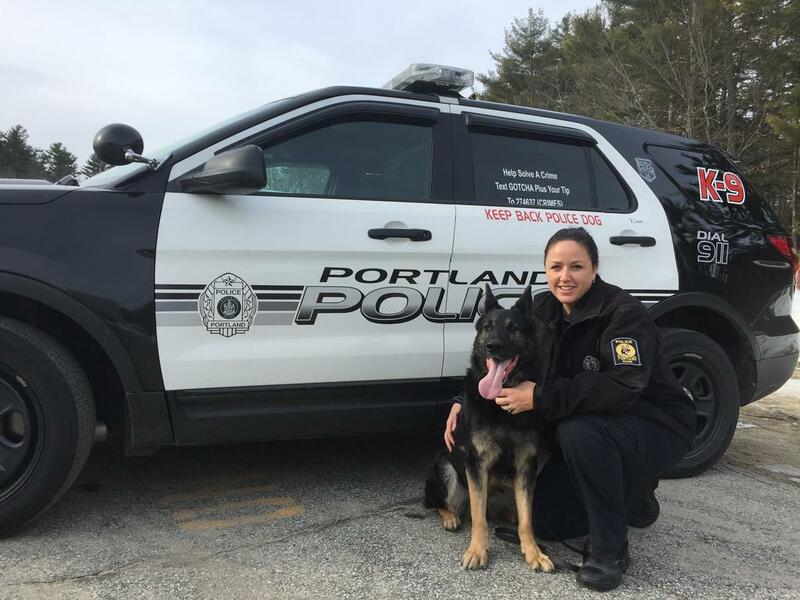 According to city of Portland spokeswoman Jessica Grondin, the spending on Portland police dogs – not including handlers’ salaries – is more than $10,000 this fiscal year. While Kaine is technically owned by the city, Cole said he will continue to live with her after his retirement. Sauschuck’s testimony said that is typical for most of their canine officers. “I can’t really explain the bond – it’s kinda something you have to feel,” Cole said during a Jan. 29 training in North Yarmouth with canine teams from several different police departments. She said handlers from the Gorham, Windham, Scarborough, Freeport, Falmouth, Old Town, Old Orchard, Ellsworth, and Westbrook police departments get together on a weekly basis. Other regional groups meet elsewhere in Maine and New Hampshire, she said. “This community is really large – we’ve got friends all over the state,” she said, noting that the network has helped rally support for the bill. Steve Stubbs of the Windham Police Department said the training events provide an opportunity for canine units to learn from each others’ experiences. “We try to train them for any situation,” Stubbs said about the dogs. He is partnered with the town’s new and current canine officer Kora, who lives with him. “They rely on you just as much as you rely on them,” Stubbs added. The Falmouth Police Department’s only canine officer, a 3-year-old German short-haired pointer named Greta, belonged to Harbormaster Alan Twombley as a pet before he realized her detective potential. Twombley said he transferred ownership of Greta to the town for liability reasons when she joined the department. She is now a fixture at Falmouth Town Landing and helps other agencies, including the Coast Guard, search vessels for drugs. He also said he’s very supportive of Fay’s bill. “If any dog is going to need medical care, it’s her,” Twombley said, noting that Greta is prone to injuries. Stubbs said he’s not surprised that canine handler can be a popular position within police departments. “You get to work with your best friend every day,” Stubbs said. Portland Police Officer Michelle Cole, of Casco, has worked with her canine partner Kaine for more than seven years. Cole is working with Rep. Jess Fay on a bill relating to first aid and emergency care for police dogs like Kaine. Falmouth Police dog Greta takes a break after a training exercise where she worked to locate drugs hidden in a room. Windham police dog Kora lives with her handler Steve Stubbs.